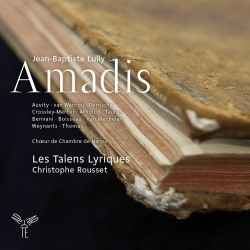 The work of Les Talens Lyriques under Christophe Rousset has an enviable reputation. Their live recordings of French Baroque operas - like this one made in Versailles itself - are becoming something of a series of benchmarks. For all the exposure which this idiom has received in the most recent generation of recordings, it may still in part be alien to listeners. Against this background it can be argued that the greatest achievement of Rousset and Les Talens Lyriques is to render this idiom truly enjoyable, accessible and even immediate. Lully’s writing depended so much on contemporary performance traditions; and ones that were accepted, were specific to time and place and ones that brought together the strengths and exigencies of text, spectacle and dance as well as music. Such a blend of idioms may seem mannered, even inward-facing. Not least because of the circumstances attendant on the long-established and dominant patronage of the royal court; Louis XIV chose the theme for Lully. No doubt the formulae established by Lully and librettists Molière and here Philippe Quinault allowed success to breed success. It’s necessary for a shrewd director - like Rousset - sensitively to emphasise the particularities of the music of Amadis; not of a ‘genre’ and - emphatically - not to let such a more general approximation of the idiom elide the beauty, the penetrative insights into human nature and the revelations which Amadis itself consistently affords. He works intelligently to offer us its instrumentation; the subtleties of its melody and harmony; the ways in which its rhythmic energy - including Lully’s infamous dotted crotchets, which we hear from bar one of the Overture - nevertheless deserve to be communicated as fresh and significant. He succeeds. In this case, Rousset privileges the text and the singers are closely miked. The inevitable passions and anxieties of love elevated to a ‘code’ fit well in such a fast-moving pace and framework as that built by Lully here. Amadis - or Amadis de Gaule as famously, and mercilessly, parodied in Don Quixote - is a tragédie en musique in a prologue and five acts. Quinault’s libretto uses Nicolas Herberay des Essarts’ adaptation of Garci Rodríguez de Montalvo's Amadis de Gaula. First performed at the Paris Opera at the Théâtre du Palais-Royal in January 1684, it examines not a mythological but a chivalric milieu - as was the trend in Lully’s later operas. Limpness, contentment with the default, satisfaction with the letter - rather than the spirit - of these formulae are all entirely absent from Rousset’s enterprise here on these three CDs from Aparte. Rather, Rousset’s approach is taut, exciting and full of the appropriate momentum. Not, though, that he has distorted or adapted Lully’s world in the 1680s. The singing is neither jaunty nor jolly. The enunciation neither precious nor over-familiar. The solo and instrumental playing also displays appropriate forward momentum without suggesting any spurious need to draw in the listener by over-accentuation or by resorting needlessly to contrived or forced phrasing. Amadis is a story of love and chivalry; and it’s potentially quite complex if taken literally. The faithful love between Amadis (tenor Cyril Auvity) and Oriane (soprano Judith van Wanroij) - resisted by the sorcerer family of Arcabonne (soprano Ingrid Perruche) and Arcalaus (baritone Edwin Crossley-Mercer) - is compared with that between Florestan (baritone Benoît Arnould) and Corisande (soprano Hasnaa Bennani). These singers all portray expertly and with enthusiasm both the personal/particular concerns of their roles and their symbolic weight. Again, Rousset has his work cut out: political developments and the need to make the best of Louis XIV’s morganatic marriage to Madame de Maintenon the year before Amadis was written and staged meant that the King’s image needed positively massaging. Such tales as those in the already somewhat passé work of de Montalvo were made to do the job for court and contemporary French audiences. Rousset must make them speak to us too. The very slightly tempered - yet never laborious - energy of singers, players and ensembles contributes to our sense of … belonging, of participation in the experience. The acoustic has just enough resonance and richness to convey the sense of how a work like this may have sounded originally. Yet the recording concentrates on presenting it to us as listeners now. Another example of that skill exhibited by Rousset in effectively rendering the praxes of one age to our own sensibilities; and without compromising either. The book with the CDs produced to Aparte’s usual high standards has full text in French and English, synopsis, background to the recording and libretto as well as entries about the ensembles, though only photographs of the principals. This outstanding set goes far beyond that of La Simphonie du Marais with Hugo Reyne on Accord 4428549 from 2006 in terms of insight, technique, wholeness and musical richness. It should be snapped up by anyone attracted to Lully, specifically this period and style; and superb music-making in general.